The natural world has been my greatest guide when it comes to sense-making and navigating life. I find great comfort in the way the seasons cycle every year, but also how she (yes, nature is a “she” to me) gives us little hints about what she’s going through and what she needs. For instance, here in northern California, we have been experiencing some of the worst wildfires our community has ever seen over the past week. We have reached that time of year when the air is hot, the grasses and brush are dry, and the land is apt to burn. Combine that with seasonally high winds and less defensible space with development of human structures, and we have had ourselves a doozy of a time keeping our towns, schools, and hospitals from going down in her flames. Throughout all the smoke and heartache, I’ve learned so much from the fire…things like impermanence, humility, interdependence with my community, and gratitude. Nature is also showing me things about myself. I look outside my window. I see the dry grasses turned a golden shade of yellow on the hills. I see the leaves on the trees turning all different shades of bright red, greenish yellow, and rusty orange. Some are even beginning to flutter down from their tree branches, landing on the soil that will envelop and compost them back into life-giving dirt. I see my garden—pretty much at the end of the line with most of its harvest taken in. The squash vines, half deadened now, are slumping heavily on the edges of the redwood box Tim built for us this past March. I remember our May and June when we had our annual panic about planting them too close to the carrots and how their leaves would block out the light for the smaller sprouts. I remember…we are in the season of dying…and it’s far easier to welcome it than to resist. This land dies, we die, and we see ourselves in all of it. So many ancient cultural traditions have taken their cue from this season of dying in nature. I’m going to spend the rest of this post specifically speak to part of my own lineage (Celtic) and talk about the celebration of Samhain (but would love it if you shared your own connection to traditions around this time of year in the comments). Samhain (pronounced sow-when) represents the beginning of the darker days. It’s the Celtic New Year’s Eve, so to speak. The Celts were pastoral people—their lives revolved around summer (light) and winter (dark)—summer for growing crops and breeding animals, winter for harvesting and hibernating. It was the final chance to dry herbs and stock the pantry to the brim for the coming winter. On the wheel of the year, Samhain lies opposite of Bealtaine (May Day). On Samhain, the cows are brought home from pasture and were passed through a cloud of smoke to cleanse and bless them for the hibernation season and on Bealtaine, they pass through water to go back out to the fields (I find this to be a lovely sentiment). The end of October would also have been the time when trade and battling ceased until the weather improved again. It was often chosen to have important tribal gatherings on the date and was regularly used as the beginning for myths and legends. It is also said that this time of year is when it’s easiest to commune with those who have passed over—replicating what is seen in nature. The veil between this world and the otherworld is thin, and the spirits, fairies, ancestors, and free folk are said to have free reign in our world and us in theirs. Offerings of food were left outside of the house to make sure the fairies and spirits stayed in a good mood (they especially enjoyed sweet foods!). It was also common for people to disguise themselves (to shapeshift) with masks and different clothes so that the fairies would find it difficult to tell people apart if they decided to mess with them with their trickster nature. The people carved faces into turnips, squashes, and pumpkins to try to trick the spirits into not coming near their home because other spirits were already there. There were central bonfires (meant to be protective) where the community would gather. Anyone who wanted to bring this protective fire into their own homes must then light their fire with flames from the bonfire. The ashes the fires left behind were considered sacred, and the people would take some to scatter on their land to bring a good harvest (ashes improve soil health, so this came true every year). So, during this season of Samhain, as I honor the seasonal transition in my body with more sleep, hydration, and less coffee, I invite you to join me in honoring this season of dying. It’s a great time to burn incense: evergreen branches, frankincense, sage, myrrh, and rosemary. In the morning, put a cast iron on a low-heat burner and sprinkle powdered ginger, cinnamon, and nutmeg to warm your home and take comfort in this time of liminality. How are you feeling this season? What have you noticed in nature around you? 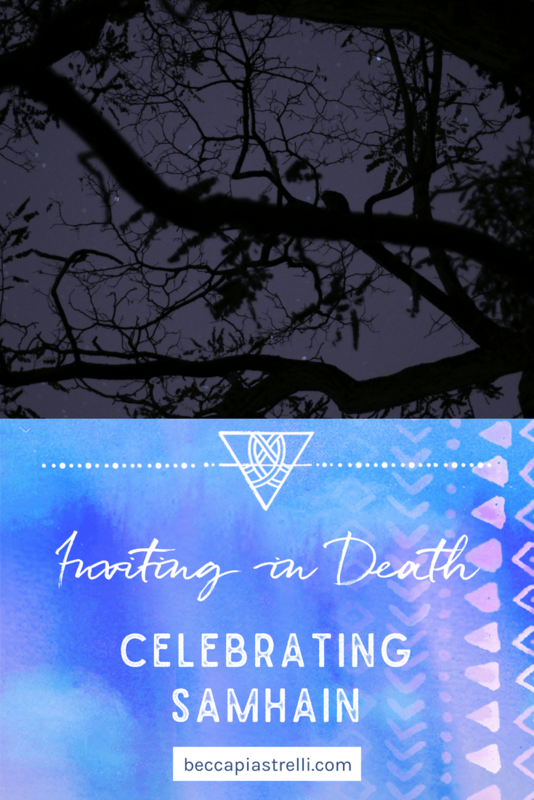 How are you celebrating the season of dying and those who have passed on?